Qt Creator allows you to use multiple versions of Qt installed on your hard disk and switch between them easily. 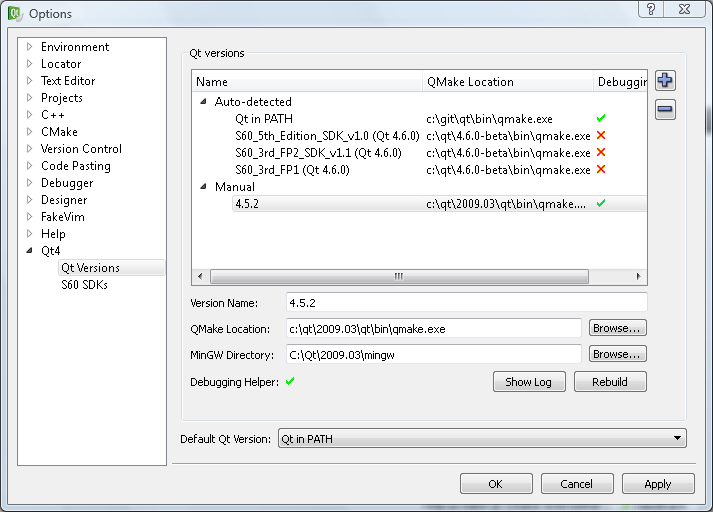 Qt Creator automatically detects if qmake is in the environment variable PATH. This version of Qt is referred to as Qt in PATH. If you use only one version of Qt and it is already in your path and correctly set up for command line usage, you do not need to manually configure your Qt version. Otherwise, you can add your Qt version in Tools > Options... > Qt Versions on Windows and Linux or in Qt Creator > Preferences... > Qt Versions on Mac OS X. The detailed settings depend on your operating system and on the targeted tool chain. 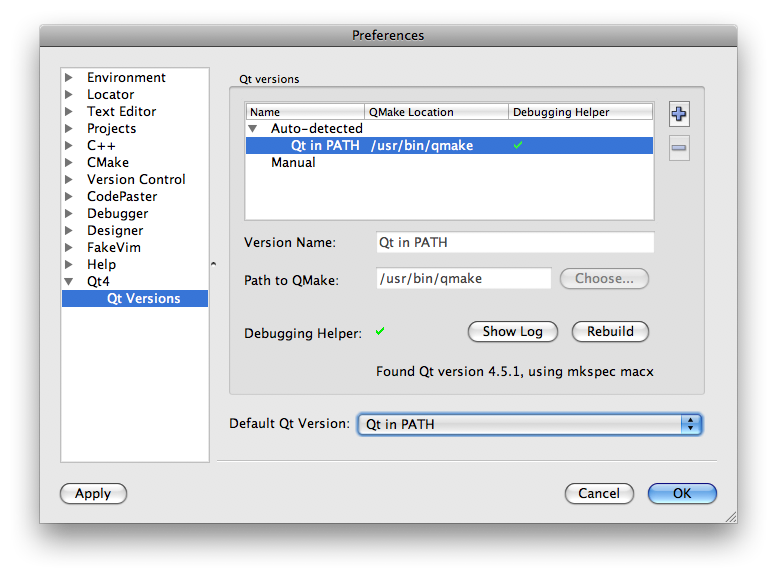 On Linux and Mac OS X, set the path to QMake to the qmake binary of the Qt installation. If a Qt is found in the PATH environment variable, it shows up automatically as Qt in PATH. On both platforms, the platform's GNU Compiler Collection (GCC) is used to compile Qt. On Mac OS, the GCC compiler is part of XCode. On Linux, the Intel Compiler (ICC) is supported as a drop-in replacement for GCC. If you are on the Windows platform and used MinGW to compile Qt, you need to tell Qt Creator where MinGW is installed. This is done by setting the MinGW directory. If you are using the Windows SDK for Windows Server 2008 instead of Visual Studio, it identifies as version 9.0. If you are using Qt for Symbian and your S60 SDK is registered with devices.exe, Qt Creator detects the Qt version automatically. It is shown in the Auto-detected section in the options dialog. You can also manually add Qt for Symbian versions. 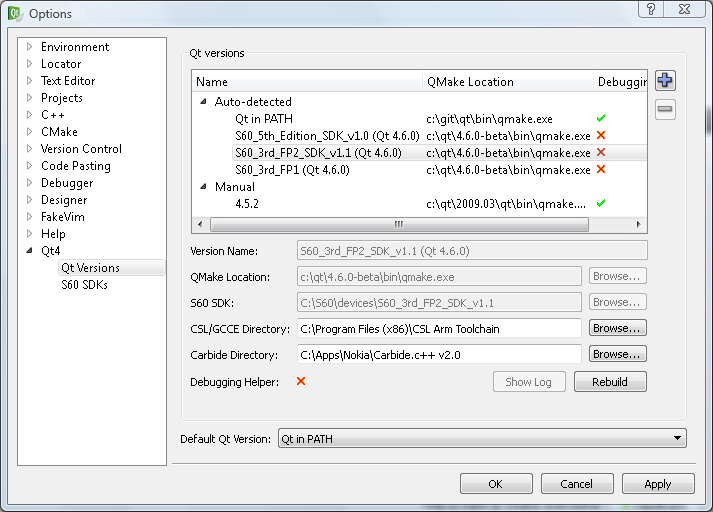 In this case you need to tell Qt Creator the path to the S60 SDK it is supposed to use with these Qt installations. Add the path to your Carbide C++ install, version 2.0 or later, if you want to build for the emulator (WINSCW tool chain). If you want to use GCCE to build for your device, you might need to add the path to the CSL ARM Toolchain directory (CSL/GCCE Directory), if the compiler is not found in the PATH environment variable. Note: By default, projects are compiled with the default Qt version. You can override this in the build configuration.